CFW AP Notification is out. 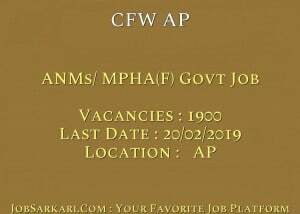 CFW AP is recruiting for 1900 ANMs/ MPHA(F) Govt Job Posts. You can check CFW AP - Department of Health and Family Welfare last date, download CFW AP notification, visit CFW AP official website and check other CFW AP Vacancy details.Complete Vacancy and recruitment Details about 1900 ANMs/ MPHA(F) Govt Job vacancies in CFW AP are provided below by JobSarkari.Com only for you. Last Date of Receipt Application. 20/02/2019. Total No. of Post 1900. Candidate Must Have Passed EITHER 18/24 Months MPHA(F) Course Conducted in the State (Recognized by AP Nursing & Midwives Council) OR 02 Years Vocational Multi Purpose Health Worker (Female) Course and have Completed 01 Year Clinical Training in selected Government Hospital. 2. Candidate Have to Download Application Form As Given on Our Website in Important Links. 3. Candidate Need to Fill All the Details in Application Form. 4. Candidate Need to Attach all Mandatory Documents Like Age Proof, Address Proof And Certificates As Mentioned in Notification. 5. Candidate Need to Send the Application Form on The Given Address Before 20th February 2019. Q. What is the Last Date For CFW AP ANMs/ MPHA(F) Govt Job Vacancy ? A. 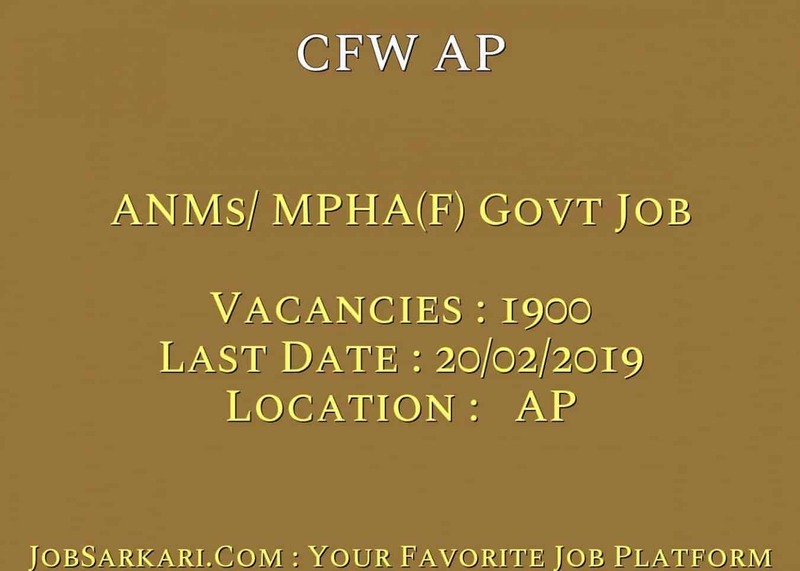 Last Date for CFW AP ANMs/ MPHA(F) Govt Job Posts is 20/02/2019. Q. What is the Form Type of CFW AP ANMs/ MPHA(F) Govt Job Recruitment ? A. The Form Type for CFW AP ANMs/ MPHA(F) Govt Job Posts is Offline. Q. How many vacancies are available in Department of Health and Family Welfare ANMs/ MPHA(F) Govt Job Posts ? A. There are about 1900 Vacancies in Department of Health and Family Welfare ANMs/ MPHA(F) Govt Job Posts. Q. What is the Full Form of CFW AP ? A. Full Form of CFW AP is Department of Health and Family Welfare .